In this example file, we have 3 records with information in a field called description. We are showing these in a portal. 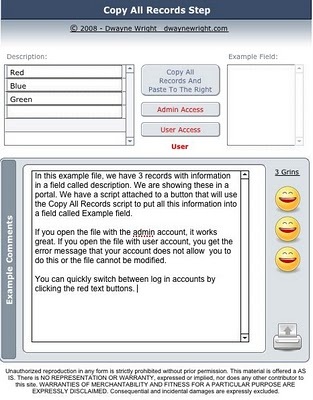 We have a script attached to a button that will use the Copy All Records script to put all this information into a field called Example field. BTW: The Copy All Records / Requests script step will copy all the contents of each field of a found set of records on a layout to the clipboard (except for graphics or sound information that may be in a container field). When this script step is executed the information in the fields is copied in a tab-delimited format. That is to say each field value is separated by a tab character and each record is divided by a carriage return value. The entire process is done without copying any font style settings, so the values that it pulls from the data fields is quite plain when viewed. This information is not usually viewed by a user but used in a parsing process. If you open the file with the admin account, it works great. If you open the file with user account, you get the error message that your account does not allow you to do this or the file cannot be modified. Yes, I have changed my FileMaker icon to Bender from Futurama. You can quickly switch between log in accounts by clicking the red text buttons. Now if you click the “run with full access” privileges check box in the script, you should be ok. However, this will affect the script in its entirety.